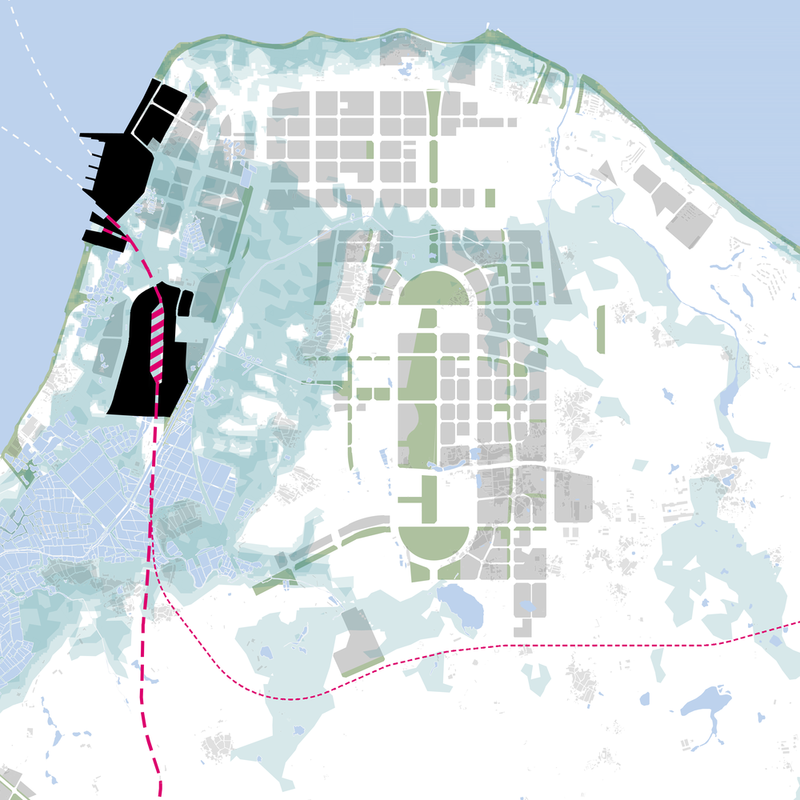 A regional map of Haikou City showing the existing buildings and planned new areas (grey), along with areas of high flood risk (20 year flood) and 3 meter sea level rise. 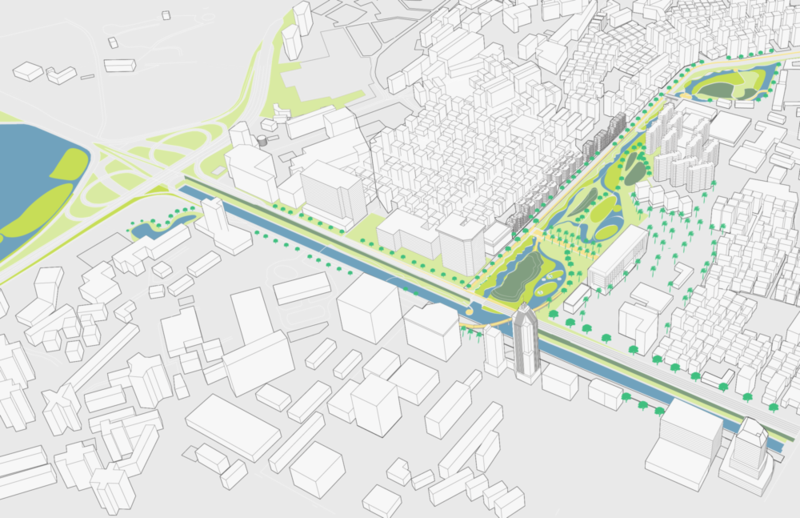 Using the city's existing water system to reduce flood risk and using open space to integrate the city. Haikou may not be a typical Chinese metropolis. In population it is much smaller than Shanghai, Beijing, or even most other provincial capitals. Yet, its current growth reflects some of the larger structural shifts underway in China’s overall development—from industrial production to higher quality urbanization centered around improving people’s lifestyles and a focus on consumption as a major driver of economic growth. With much lower air pollution levels than other Chinese cities, Haikou is sure to attract more people from the “mainland” as they seek better lifestyles. However, Haikou faces many threats. It’s rapid development threatens to undo the very qualities of the environment that have made it a popular destination. As a low-lying coastal area, much of Haikou is at great risk from flooding from heavy rain as well as sea-level rise along the coast. Some of the new urban areas planned for the city’s expansion lie in the most vulnerable areas near the coast. 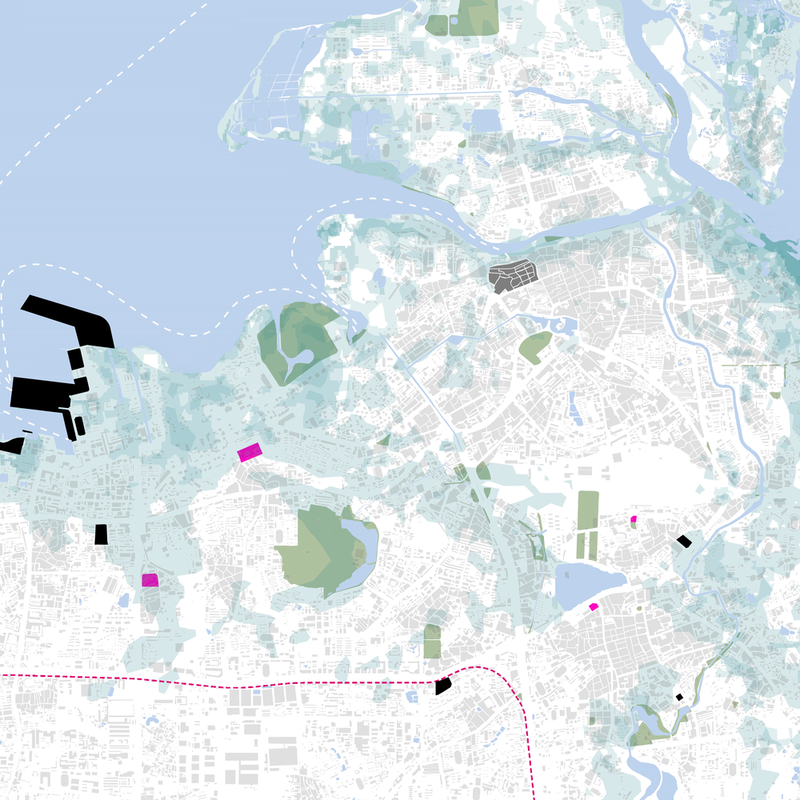 As this map shows, much of the city center is at risk of flooding from rainstorms and sea-level rise combined. A water system of canals and lakes defines the city center. Yet, the city is not making the most out of this sytem. Most of the lakes and drainage canals remain covered or walled off with concrete embankments, reducing access. 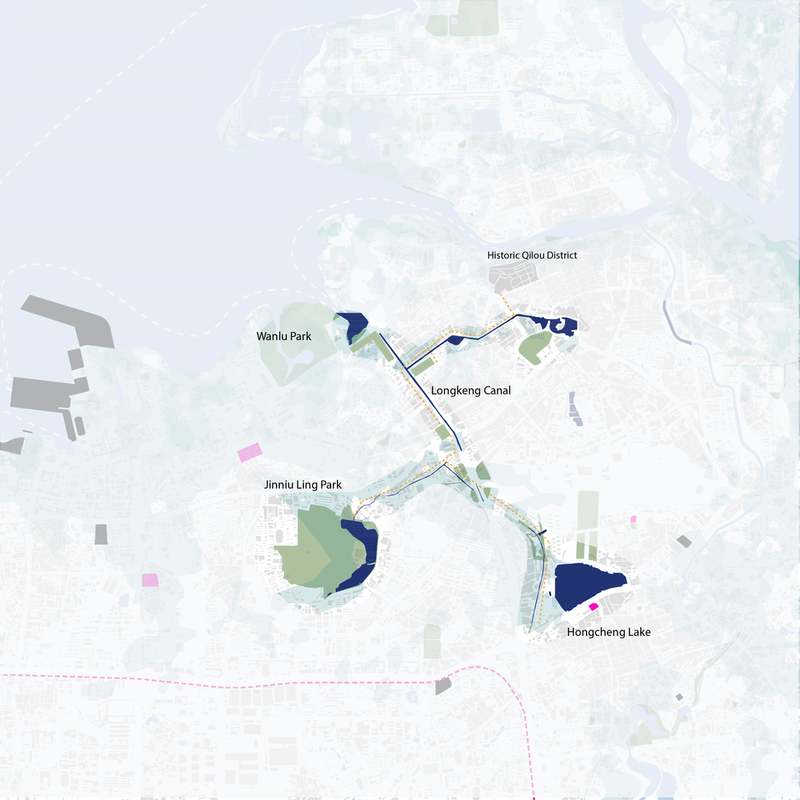 Creating landscapes that are more permeable to flooding around these water bodies would reduce risk to the rest of the city by allowing these areas to serve as sponges for excess rainwater. Low-lying sand dunes and coastal scrubland covers much of this area. Much of the city center is defined by canals and lakes surrounded by high-rise residential areas. 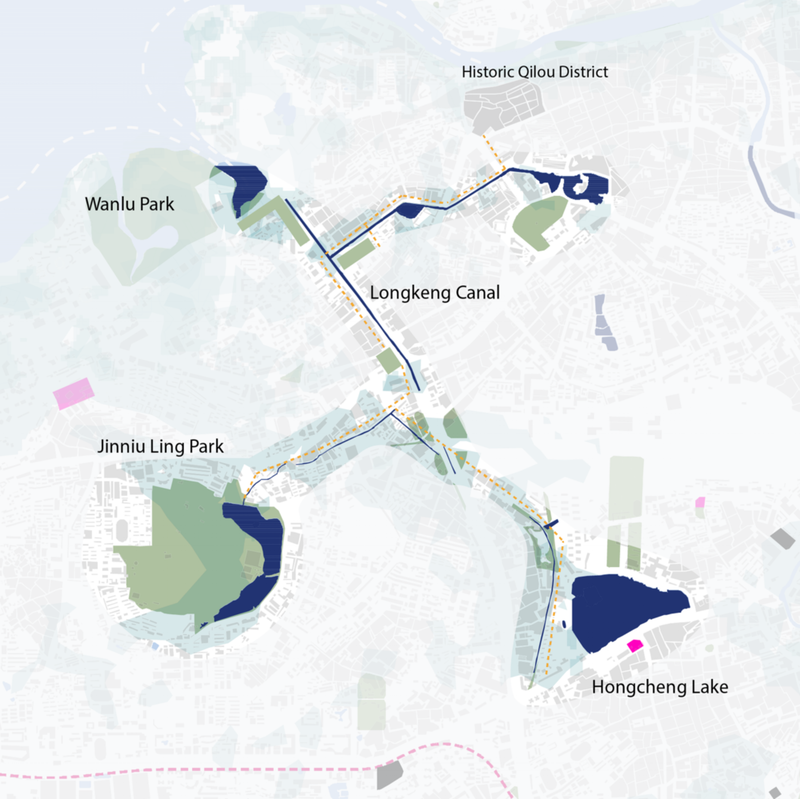 Longkeng Canal green space system, showing the proposed park and new runoff collection pond system.